Positive About Negatives: Resolve this : Does 35mm Film beat Digital 35mm and MF? Resolve this : Does 35mm Film beat Digital 35mm and MF? Fine almost became a four letter word the other day. I mean Fine Detail. A few days back, on twitter, I witnessed a fascinating and passionate debate about the age old topic - Film vs Digital resolution. It began innocently with obvious statements followed by wild counter punches which of course resulted in claims of trolls, twitter blocks and things getting personal. Being an external observer who saw this back and forth unfold in real time, I could somehow relate to both sides. I mean come on, in this era of 100MP digital medium format backs, some things just seems obvious these days - but wait, there is more than what meets the eye. But before I go any further, I have to state that I love digital - my workflow is completely digital including a modern film scanner, heavy dose of LR which serves as my content catalog, and PS, where I do all my post. I also have tremendous love for anything analog - I have a darkroom and I love wet prints, alternative prints - cyanotypes, van dykes and salts. Coming back to topic, I saw a few statements made that stood out. I unfortunately did not see a lot of scientific evidence but angry hand-waving. Being a man of science, I wanted to tackle this issue like a scientist - Let me first define the problem statement and then see what data I can gather to support or reject that statement. Pretty simple, right? The following is my attempt at looking at the film vs digital debate through the lens of resolution. (1) 35mm film had better fine detail than 35mm Digital sensors. (2) 35mm film had better fine detail than Digital Medium Format sensor. In the course of discussions, I also heard statements like $500 digital camera beats the 35mm film, so that was another area I wanted to double click. Pretty wild, you may think. Next I tried to define the problem, so we can arrive at something quantifiable, measurable. I started with this term "fine detail" which kept creeping up. If I could define Fine Detail in terms of something I could use to validate the above statements, I think I would get somewhere. My problem statement was peeking out of the fog. Distortion and Vignetting being most important parameters. Some other factors mostly important for digital images are - exposure accuracy, LCA (chromatic aberration) or fringing, artifacts and moiré. Fine Detail = Resolution - which I thought in the first place was the key point of the debate. (1) High end 35mm film has better resolution than high end 35mm Digital sensors. (2) High end 35mm film has better resolution than high end Digital Medium format camera. (1) What is high end 35mm film? (2) What is high end 35mm FF Digital sensor? (3) What is high end Digital Medium format camera? (3) I chose PhaseOne IQ180 to be a good representative candidate for a high end digital medium format. How do we measure resolution of high end 35mm film? Turns out the same way we measure the resolution of digital sensors and film. It is called spatial resolution. See more here. Spatial resolution is typically expressed in line pairs per millimeter (lp/mm), lines (of resolution, mostly for analog video), contrast vs. cycles/mm, or MTF (the modulus of OTF). There are several ways of measuring spatial resolution. 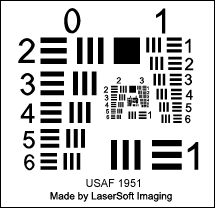 For the majority of studies in the field of optics and film, a system known as the USAF 1951 target is used. When I say lp/mm in this post, that is the measurement system that was used. Most film manufacturers used to and still in many cases publish film resolution numbers for their film in lp/mm and it is these published numbers I will use in our experiment. The resolution of the photographic system (sensor + lens), depends on the weaker link – if the sensor has a lower resolution than the lens, the final resolution will equal that of the sensor and vice versa if the lens is the weaker link. R represents the system resolution (and consequently the final resolution of the photograph), RS represents the image sensor resolution and RL the lens resolution. Resolution is measured in line pairs per millimeter (lp/mm), where a line pair consists from a white and a black line. The image sensor resolution of the Nikon D800 is 102.5 lp/mm (7360 : 35.9 : 2 – the number of pixels on the longer side of sensor divided by the length of the longer side, divided by two) or approximately 100 lp. In the same way we can calculate the image sensor resolution for the other test cameras: D3 (59 lp/mm), D4 (68 lp/mm) and D3X (84 lp/mm). Here I will just point you to this great article . I will leave you to make your own conclusions. (1) 35mm high end film has higher resolution than high end 35mm Digital camera seems accurate. (2) Shockingly, the 35mm high end film beats the Digital medium format in resolution as well. Now the caveat in any resolution discussion is the optical resolution of the glass being used. Your system resolution will depend on the quality and resolution of glass being used. However if you assume that the same optical medium is used in either scenario, film does have more native resolution than digital sensors as shown above. Now this begs the question why would you pay upwards to 25k for digital medium format if the lp/mm is worse. Hope you enjoyed this brief note. Feel free to leave your thoughts. That's a beautiful article! Thank you! The thing you've failed to mentioned is that, at ASA/ISO 6 and 32, Kodak Technical Pan and Kodak Panatomic X are extremely low-speed films. They require very fast lenses(no smaller than f/1.4) and/or tripods to obtain a sharp photograph. ...as well as powerful strobes.